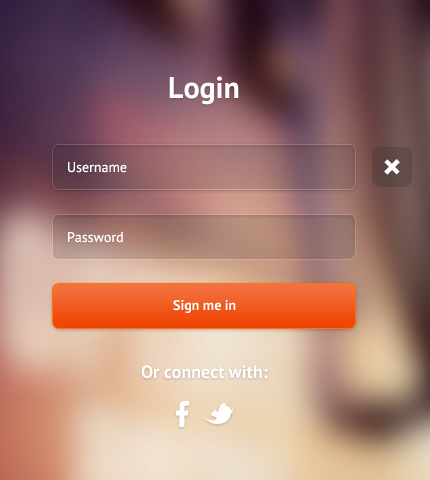 Today’s freebie is a nice login form with fullscreen background slideshow that you can use in your next login page. It comes in HTML5/CSS3 version, so you can implement it right away, and also in PSD format if you want to play with colors and effects. The form has also a simple jQuery validation to prevent users from submitting it with empty fields. Take a look at the live demo below, download it and enjoy! You can use this login template in personal and commercial projects, but you can’t sell or distribute it directly, “as is”. If you plan to use it, a link to this page or any form of spreading the word will be much appreciated. Photos used in the live preview by: Shermeee. Supersized – Fullscreen Slideshow jQuery Plugin by: Build Internet. Nice login form… But where do I set the User Id and Password? You can set it, for example, using php and mysql. The background image doesn’t work… any suggestions? Awesome job! I really love the form. I have some questions about building a “results” page based on this theme. Please send me an email and I’ll get you some more info. Hi, good share, how to add more photos and change the time of movement? Add more links to images in ‘slides’ parameter in similar format..
Can you give a link to iconset? I want a g+ icon..
Where should i add the code to work? How to install this login design into my wordpress site? But, please, How do I make it work? I mean, how can I add PHP and MySQL to it, and make it wok correctly like any other website like facebook, any website has a login form???? The login is really awesome, but I have the same problem. How can I to add PHP code. HI! I’ve used your template and I totally fell in love with this one! Thank you so much for sharing !! Can this be integrated to wordpress DB?